Mysuru: In its efforts to promote an environmental-friendly Ganesha Festival and afforestation, city’s Join to Help Charitable Trust is distributing 1,024 free eco-friendly Ganesha idols that have been embedded with a seed-ball each. The idea is that once the idols are immersed, the seed ball germinates and grows into a tree. Free Ganesha idols were distributed this morning at a programme called “Mruthyunjaya Ganapa” at the Jayamarthanda Gate of Palace. Join to Help Charitable Trust President Jeevitha Mahendra said that the members of the Trust comprised working professionals and students in the age-group of 20 to 25 years. “Following a movement to use eco-friendly Ganesha, this year we have brought out a unique concept where clay Ganesha idol is made and a seed-ball is embedded into it. As the Ganesha will be immersed in a water body, the seed-ball will have ample chances of germinating,” she said. “We have roped in Ganesha artist N. Sunil, a resident of Hebbal, to make 1,024 Ganesha idols, named ‘Mruthyunjaya Ganapa’, which have seed-balls at the base. 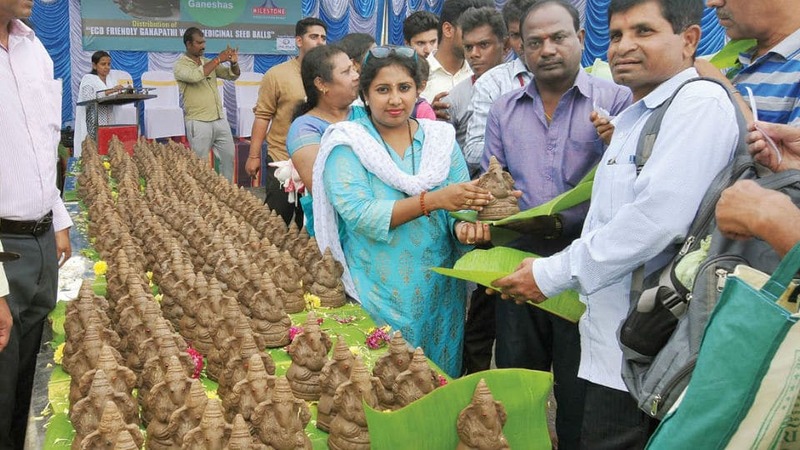 The pure clay Ganesha idol without any artificial colour or paint has gulaganji or Abrus Precatorius (commonly known as crab’s eye) seeds embedded in it,” she said and added that the idols will be distributed at 10 Ganapathi temples across the city, 101 at each location. The remaining will be distributed to government officials. Government offices, including the Deputy Commissioner’s office, Mysuru Palace Board, will also be given the idols. Trust Secretary Dhanushkumar said that Ganesha idol need not be immersed in water after completing the festival and puja. “It can be just placed in a pot and watered. Like watering a plant, it can be watered and after a few days the plants will germinate, as the clay of the idol dissolves and mixes with mud,” he said. He said that they have mostly inserted seed balls of medicinal plants like Tulsi, wild Tulsi and oregano, and of trees like neem. Seeds have been procured from Srirangapatna.